During the Megomuseum interview with Neal Kublan, he mentioned that the name "World's Greatest Superheroes" came from a cartoon package shown in NYC during the afternoons. The DC heroes were a homerun for Mego, whose character selection was obviously influenced by the reruns of the 60's Batman TV series now playing after school. By the mid 70's, DC characters ruled Saturday morning with the Superfriends, Filmation's New Adventures of Batman & Robin and Shazam! TV series in full swing. 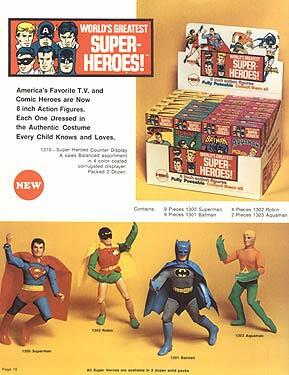 The DC heroes were leading the Superhero revolution and Mego made millions from it. The love affair with DC never truly waned, while attention was shifted to Marvel in terms of figure selection in the mid seventies. Mego continued to create playsets and vehicles for existing DC characters, even Aquaman got his own playset!